Stainless steel housing and handles. Easy to clean detachable oil tray. Healthy cooking with less oil. The Glen GL 3033 Glass Grill features a glass plate that allows you to grill meat, fish, and chicken conveniently. It is apt for indoor use as it emits low heat radiation while the food is being processed. Furthermore, this glass grill lets you prepare delicious dishes with less oil, thereby keeping your meals healthy and nutritious. Glen 1200W Silver Glass Grill, GL 3033 is a premium quality OTG / Oven Toaster Griller from Glen. Moglix is a well-known ecommerce platform for qualitative range of OTG / Oven Toaster Griller. All Glen 1200W Silver Glass Grill, GL 3033 are manufactured by using quality assured material and advanced techniques, which make them up to the standard in this highly challenging field. 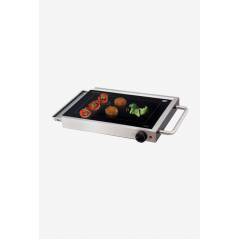 The materials utilized to manufacture Glen 1200W Silver Glass Grill, GL 3033, are sourced from the most reliable and official OTG / Oven Toaster Griller vendors, chosen after performing detailed market surveys. Thus, Glen products are widely acknowledged in the market for their high quality. We are dedicatedly involved in providing an excellent quality array of Glen OTG / Oven Toaster Griller.